Stingrays glide through the water as though they are flying, rippling and slowly flapping their sides almost like wings. These creatures are graceful and beautiful, and they can be spotted both in captivity and in the wild in Key West. If you want to get up close and personal with a stingray, then we recommend going on one of the many Key West snorkeling tours available. Stingrays are found in shallow waters, which is perfect for snorkelers to try and locate their camouflaged bodies. There are several types of rays around the world. Giant stingrays have been found in the Indian Ocean, but they are rare and very little is known about them. Spotted Eagle rays can be found gathering in groups in the Indian Ocean near Maldives. And Manta rays, the very large stingrays, can travel in packs of 200! 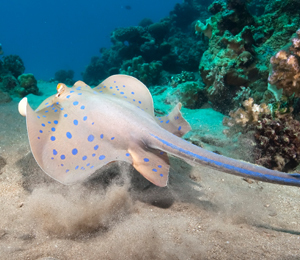 While nearly all rays prefer warm waters, they are not all of the same species. The smaller rays, like stingrays, are separate from the very large rays, like Manta rays. In Key West, you can find the smaller stingrays native to the Atlantic Ocean. There are areas here where you can interact with and feed the rays as they are friendly creatures, and even in open waters, stingrays rarely attack unprovoked. Stingrays are boneless fish, and their skeletal structure is comprised of cartilage. Whether you’re heading to the Key West Aquarium or going out on one of the many Key West snorkeling tours available, it’s likely that you’ll see a Cownose ray. These stingrays are native to the Atlantic Ocean and are small in size. They are also friendly, and can be identified by the distinct shape of their nose which resembles a cow’s nose! Cownose rays can often be found traveling in herds, flapping their sides as they fly underwater. What does a stingray look like? Stingrays have flattened bodies with pectoral fins and a long, pointed tail. Their eyes can be found on their dorsal sides, but mouths, gills and nostrils are located on the underside of the rays. When stingrays move, most “swim” by moving their body in the manner of a wave. However, some are able to move their sides so that it appears as though they are flapping wings. They also use their tail to steer and move quickly in the water, but the tail is most commonly used for protection. Stingrays have very sharp tail barbs which can be venomous. They often have a serrated edge with an extremely sharp point, so that a single jab can be fatal. However, stingrays are generally docile and typically only attack when provoked. Stingrays can grow quite large, up to 6.5 feet long, and the males can weigh nearly 800 pounds. Female rays are usually smaller than their male counterparts, and rays can live anywhere from 15 to 25 years. Where can I find stingrays? Stingrays usually stick to shallow waters near the coast in temperate climates, spending most of their time buried in the sand. Their bodies reflect the shading of their surroundings, allowing them to stay camouflaged in order to hunt or evade predators. Many types of rays can be found in the Indian Ocean when monsoons and tides push smaller sea creatures near the coasts. This provides an underwater buffet for the rays, and hundreds can be found participating in the feeding frenzy. In Key West, stingrays can be found in shallow coastal waters, hiding in the sand, and also in areas where food is plentiful, like the coral reef gardens. What do Key West stingrays eat? Stingrays are carnivores, and similar to sharks, stingrays use electrical sensors to hunt and maneuver through the water. These sensors are special organs known as ampullae of Lorenzini, and they are capable of sensing electrical charges given off naturally by predators and prey. Some stingrays have very sharp teeth, allowing them to eat oysters and clams by crushing the hard exteriors. Bottom-feeding stingrays feed on shrimp, clams and crabs, and other species of rays opt for plankton and krill.